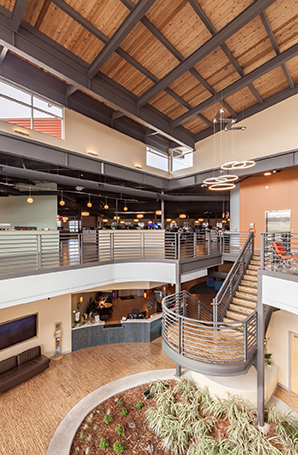 As MINDBODY, a business management software company, began growing in both the clients it serve and the size of its staff, it became apparent a new headquarters was needed to anchor its campus of existing offices in San Luis Obispo, Calif. Founded by Rick Stollmeyer, CEO, in 1998, MINDBODY serves the needs of health, wellness and beauty professionals around the world. The company provides services, which include web scheduling tools, automated marketing and point-of-sale processing for small businesses such as yoga studios, fitness centers and spas. San Luis Obispo-based RRM Design Group developed the master plan concepts for the 60,000-square-foot, two-story headquarters and four-story parking garage. A large entry plaza functions as an outdoor meeting space for the entire campus. Inside, upper floor walkways overlook the atrium lobby, a high-volume space with comfortable seating. Iconic architectural features sit along the main entry drive to help identify the campus, which also includes landscaped pathways that connect the existing and new office buildings. According to Mike Scott, LEED AP, manager of architecture at RRM Design Group, the headquarters provides a working environment that supports the health conscious, energetic and hard-working atmosphere of the company, which values the connection of mind and body as one, and its software products support that vision. “The headquarters is a place for people,” Scott says. The first floor features meeting rooms, collaboration spaces, an exercise room, daycare facility for employee’s children and full-service café. “Each of these spaces carry the theme of exposed steel structure as a familiar building component throughout,” he adds. The second floor is the open working platform for the employees. “The floor is connected throughout with open visual connection across the entire floor,” Scott explains. MINDBODY wanted to use the building plaza for company-wide gatherings. However, Scott says the area has a strong prevailing wind that affects these gatherings. “The building was designed to protect the plaza from the wind by shielding it with the arms of the building extending out around the plaza,” he says. 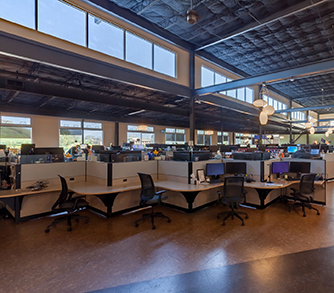 In looking for a contemporary and inspirational building to match its role as the leading global online marketplace for wellness services, MINDBODY was inspired by tech companies throughout the world. Scott Martin, LEED AP, design director at RRM Design Group, designed the headquarters to feature a sweeping butterfly roof that defines the entry and serves as the focal point between the two large building wings. To break up the mass of the two simple, but large wings of the facility, the building is clad in both metal siding and stucco. “The metal siding reflects the warmth of the company’s signature orange color and gray, combined with large expanses of glass, creating a modern look suited to the burgeoning tech company,” Scott adds. On either side of the entry, metal wall panels provide a durable finish in a high-traffic area, while also providing a strong anchor for the entry tower. “The horizontal rib further provides a gradient of light when illuminated at night near the entry,” Scott explains. At the clerestory sloped roof that protrudes from the center of the building, metal wall panels capture the northern light, where Scott says the corrugated metal lines emphasize the horizontality and energy of the building as it is viewed from the public street. To emphasize the durability of the building and its high-tech feel, metal wall panels are also used at the soffits of the bridge and canopies. Metal Sales Manufacturing Corp., Louisville, Ky., supplied 25,000 square feet of 24-gauge VLine 32 ribbed metal panels in Terra Cotta for the project. The metal wall panels were selected for their contemporary look and long-term durability, as well as recyclability. While seeking LEED Silver certification, Scott says the MINDBODY headquarters is currently tracking closer to LEED Gold certification. Using a combination of LED fixtures and lighting goals, the project has reduced lighting power by nearly 73 percent. The building has a high-efficiency building envelope with R-19 walls include additional exterior rigid insulation, an R-30 roof and high-performance glazing. Based off of ASHRAE 90.1, the building’s standard energy consumption has been reduced by 38.74 percent. Additionally, there are 10 electric car charging stations and preferential parking for carpool, vanpool and fuel-efficient vehicles. 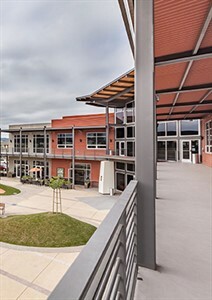 MINDBODY Headquarters, San Luis Obispo, Calif.